Venus and Sedna – A Difficult Choice. The Current Opposition Between Venus and Sedna Asks Us to Examine Our Love of Earthly Luxury and the Plight of Our Planet. Written by Alison Chester-Lambert on 24th November 2009. This was being written on Tuesday 24th November as the UK was hit by massive rainfall and flooding, particularly in Cumbria. In England at this time, quite the opposite was happening, with one of the driest periods of the 20th century beginning in November 2004. (2) It is important to remember that all the planets can represent an abundance or depletion of the stuff they represent. Sedna represents climate change and huge global movements of water, so she can dry out one place and dump mega-amounts of it in another. She also represents the lonely cry of a single seagull that echoes through the vast, frozen artic wastes; the terrified barking of a desperate polar bear cub, clinging to the melting ice in bewilderment at the loss of her starved mother and the emptiness of the once whale-filled seas. Her life is lonely, filled with the bitterness of the betrayal by her husband, her father…….. and now the whole human race. For Sedna represents the marine animals that we have murdered into near extinction. Today, there will be those of us who feel this very closely, who can’t deny the vast and empty hollow feeling and the pain of so much abuse. But Surely, We Could Find a Weather Event Somewhere on the Earth at Any Time? I have heard the argument that a planet cannot influence the weather here on Earth and that I can match weather events to Sedna activity in astrology because it would be hard not to find an extreme weather event somewhere on planet Earth most days. Okay….go for it! I’ve been studying this for some time and invite anyone to have a look. I have always taken as a yardstick the main news stories on Skynews, if it is in the headlines, it counts as Sedna stuff. As it happens, there isn’t a large weather event anywhere on the planet every day, so it is easier to research than it seems. These days, I tend to spot the news report and then rush to the astrology chart to check out what she is doing. Most times she is active astrologically. What seems to be a trademark of Sedna are the extremes that she introduces. The type of event that passes off as a climate change issue, which is indeed her theme. In the groups I run, we always note the times when it looks as if she will be active and any member would be pleased to confirm our 100% accuracy rate so far. You do have to take the whole of planet Earth into account and there is a jolly good scientific reason for that, which I will explain very briefly, although I suggest you see a forthcoming article for more detail. Planets Affect Space Weather, Which Affects Earth Weather. Or, Because Earth is a Planet, Earth Weather Affects Space Weather.....Whatever! In the last few years a new branch of science has emerged and it concerns itself with space weather. Although this sounds more like science fiction than science, proof is now available that the huge movements of charged particles, gravitational and electromagnetic energy in our Solar System cause weather events here on Earth. `Space` is an electromagnetic ocean. These weather events can be particular to certain times of the years when certain things happen because Earth is in a particular position to the Sun, or they can be because the Sun itself is having a paddy. 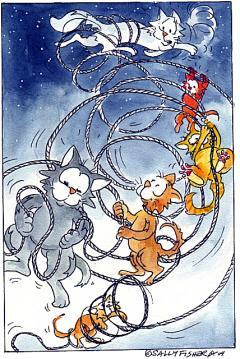 But it can also be because the Solar System is filled with gravitational corridors that weave through the planets like ropes. 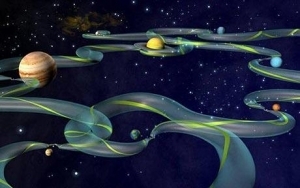 (3) They are like a giant waterslide in a theme park and if you can get in one you are transported around in a similar way, whooshing around the planets and moons with the huge flows of gravity. As our Earth moves in its orbit around the Sun it passes through the influence of these corridors and they affect the Ionosphere around our planet. There is a growing body of evidence which links all manner of terrestrial events, such as earthquakes and typhoons, with these flows of gravitational and electromagnetic tides around the Solar System. The connection is the Ionosphere and how it appears to bulge or suddenly heat up in events called `stratwarms`. These in turn are linked to atmospheric tidal waves and planetary waves which move around the outer atmosphere of our planet. Hanli Liu at the U.S. National Centre for Atmospheric Research has designed computer simulations that he claims reveal the chain of events in the lower and upper atmosphere that link terrestrial weather to space weather. (4) In the last few years these have been getting a lot more frequent as Sedna and global warming get into gear. Now, most of us know that the when the Moon passes over the face of the Earth all the water rises up in a hump underneath her, causing the tides, so it is not a big leap to see that there are times when the Moon is in a position to join with other huge magnetic, electromagnetic or gravitational forces to influence water. Putting it briefly and simply then, the Moon or any of our planets can get into situations where their electromagnetic waves or gravitational flux ropes engage with those from Sedna and Sedna’s stuff is felt on Earth. Last week it was the Moon and the Sun who got on the opposite side of the Earth to Sedna and upset her. Tonight it is the turn of Venus. What Does Venus Represent in the Collective? More than any other planet, Venus represents our love of our physical plane of existence and all its manifestations. The tangible, from money to wine and love-making. She luxuriates in the delight of owning, desiring, demanding and sensual feeling. She is earthy, a `giver of life` and a supportive earthly goddess or energy. She helps us to feel protected and secure and isn’t afraid to come out fighting for this cause. The Ancients asked Venus to give them success in battles for territory or achievement. cartoon by Sally Fisher. See below for citation. So What Does This Mean Will Happen Tonight, 24th November 2009? Well, let’s have a think! Sedna is chucking it all everywhere still and the poor people of Cumbria and Cockermouth must have their hearts in their hands. However, Venus protects and they need to take solace from this. On a global level though, what Venus does represent is how we suit ourselves and give ourselves what we want `because we’re worth it`. Western civilisation has been helping itself to too much in the name of luxury and have-it-all-now. We have acted as if we have a spare Earth tucked away to start on next, when all the pleasures of industrial growth have exhausted the raw materials on this one. With Venus on one side of us and Sedna on the other, perhaps we can see this clearly today. I think we need to send Sedna as much love and homage as we can muster and perhaps we can start to persuade Venus to protect and love Sedna too. These goddesses are currently on opposite sides of planet Earth, but they are also on opposite sides of the argument between the human race and our need to give ourselves what we want, and Mother Nature. However, in astrology Venus DOES represent nature and the Earth too. We have been using her in a more selfish way. Lets use our Venus to love Sedna as well! The top image is from http://www.spaceweather.com/index.php It is of an `icy halo enigma`. 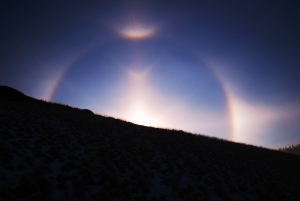 Rays of light from the rising sun mix with ice crystals called "diamond dust" and luminous arcs fill the sky. This picture is real and untouched. How this forms is an unknown mystery to atmospheric optics experts. It was taken by someone known as Jay in Silvercreek, Colorado just after the full moon in Scorpio on the 16th Novemeber 2009. (3) EDWARDS, L. (16/9/2009) Gravitational Space Corridors Could Slash Space Travel Costs. Physorg.